In recent years Sigma has vastly expanded its “Art” (A) range of premium optics to include prime and zoom options in a variety of lens mounts for both APS-C and full-frame DSLRs, as well as for mirrorless cameras. Sigma’s flagship range of prime Art lenses featuring a maximum f/1.4 aperture includes 20mm, 24mm, 35mm, 50mm, and 85mm options. The 20mm f/1.4 A is the newest addition to this lineup, and becomes the widest angle f/1.4 aperture prime currently available. Offering a 94.5-degree angle of view, it’s an ideal focal length for landscape or architectural work, and the fast f/1.4 aperture makes it a great option for low-light shooting, including astrophotography. Available in Canon, Nikon, and Sigma lens mounts, the Sigma 20mm f/1.4 A is specifically designed for use on full-frame cameras, but will work on APS-C models, too, where it offers an equivalent 30mm on Nikon, or 32mm on Canon APS-C. The lens’s optical configuration utilizes 15 elements in 11 groups, including both F Low Dispersion (FLD) glass and five Special Low Dispersion (SLD) elements, which Sigma claims maximizes image quality while paying special attention to edge performance. The Sigma HSM autofocus motor should ensure snappy AF performance, and the 9-rounded aperture blades will help render beautiful background bokeh. Build quality is good, using high-grade plastic, a metal lens mount, and a large ribbed focus ring, together with a focus distance window and a built-in petal lens hood to shield against flare. 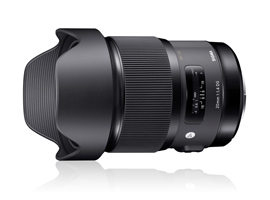 The Sigma 20mm f/1.4 A is also compatible with Sigma’s USB dock (available separately) for updating the lens firmware and for fine-tuning the autofocus to achieve the greatest sharpness at the wider aperture settings. 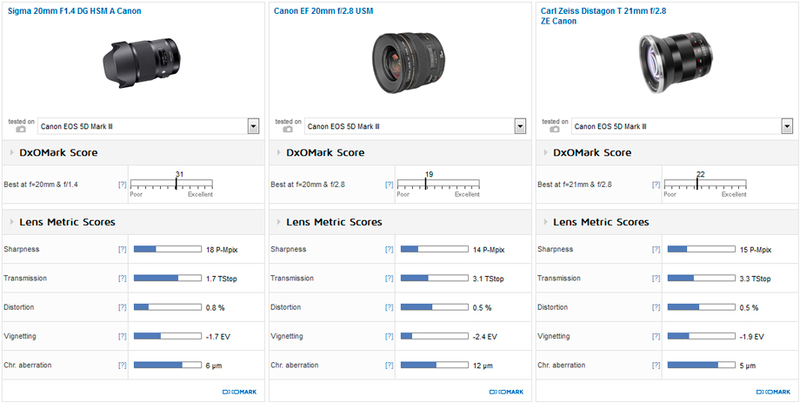 With the DxOMark scores for the Sigma 20mm f/1.4 A in and verified, we’re delighted to present the roundup of all the results in our comprehensive review. Achieving an outstanding DxOMark score of 40 points tested on the EOS 5DS R, the Sigma 20mm f/1.4 A is the top-ranked Canon EF mount wide-angle lens we’ve tested. Considering all EF options with a focal length of 24mm or wider, the Sigma Art prime offers the best scores for sharpness, vignetting, and chromatic aberration in this group. It fares very well on lower-resolution Canon full frame DSLRs, too, scoring a very good 31 points overall on the 5D Mark III, 1Dx, and 6D models. 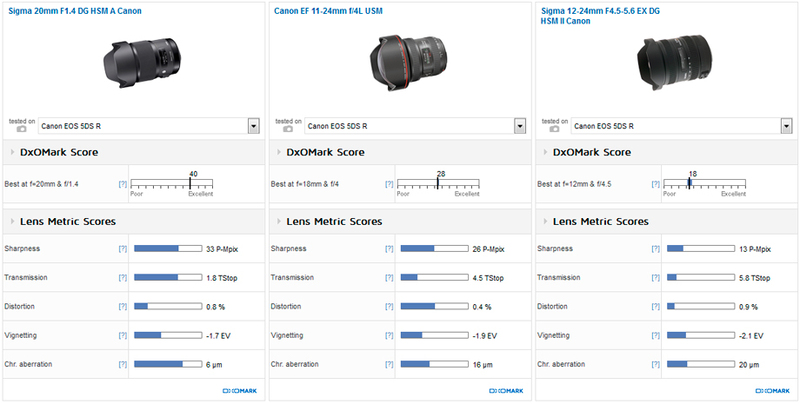 Analyze these results a little more deeply, and it’s clear that despite the lower overall score, the Sigma 20mm f/1.4 A performs well on all Canon full-frame DSLRs. 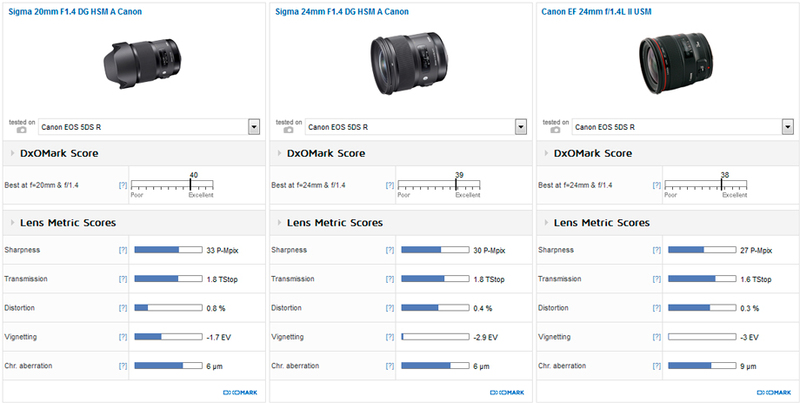 With almost identical lens metric scores for transmission, distortion, vignetting, and chromatic aberration, the difference in the overall score comes down entirely to the sharpness scores. A score of 33 P-Mpix for sharpness on the 5DS R is outstanding (in fact, it ranks as the 21st sharpest lens we’ve ever tested), but results on the lower-resolution sensors are no less impressive. Although its sharpness score of 18 P-Mpix on 5D Mark III appears significantly lower than the result for the 5DS R, when you take into account the DSLRs’ sensor resolutions, it paints a different picture. The Sigma 20mm f/1.4 A actually realizes more of the resolution potential of the 5D Mark III’s 22.3Mp sensor at around 80% (18 P-Mpix/22.3Mp = 0.8) compared to 66% on the 50Mp 5DS R (33P-Mpix/50Mp = 0.66). So in short, the Sigma 20mm f/1.4 A is a very sharp lens on all Canon full-frame DSLRs. Resolution between mid-f/4 and f/8 apertures delivers 80% acutance, with strong edge-to-edge results. At the narrower f/11 and f/16 apertures, resolution continues to be uniform, with high levels of acutance (over 70%), which is very good at these settings. Center resolution is outstanding at the wider apertures, too. Although sharpness isn’t completely uniform between f/1.4 and f/2.8, it’s still very good, delivering around 80% acutance in the center, dropping to 65% in the outer field at f/1.4, with the edges continuing to improve as the aperture is closed down. Barrel distortion is a little heavier at 0.8% compared to some wide-angle lenses of this type, but it is certainly acceptable and correctable in post-production. We recorded heavy vignetting of –1.7Ev at the maximum f/1.4 aperture, but closing down 1 stop to f/1.8 improves it markedly to –1Ev, and vignetting is virtually eliminated between f/2.8 and f/16. Chromatic aberrations are also very well-controlled, with only tiny edge fringing in the very far corners visible at wider apertures up to f/2.8. That shouldn’t cause much concern, and fringing is eliminated between f/4 and f/16. The Sigma 20mm f/1.4 A’s measured TStop transmission loses 1 stop at 1.8TStop, compared to the maximum f/1.4 aperture, but light transmission is still very good, making the Sigma 20mm f/1.4 A a very bright lens to use in low-light scenarios. For wide-angle primes, Sigma’s sister Art model, the $849 24mm f/1.4 A, and Canon’s own $1549 24mm f/1.4L II USM also boast excellent scores. Their longer focal length results in less distortion, and while scores for transmission and chromatic aberration are similar, the wider Sigma 20mm f/1.4 A delivers the greatest overall sharpness with the least vignetting. If you’re looking for a prime as wide as the Sigma 20mm f/1.4 A, however, older models, including the $539 Canon EF 20mm f/2.8 USM or the now-discontinued Carl Zeiss Distagon T 21mm f/2.8 ZE aren’t as sharp when tested on the 5D Mark III, have reduced light transmission, and in the case of the Canon EF 20mm f/2.8, notably worse scores for vignetting and chromatic aberration. So the Sigma 20mm f/1.4 A appears to be the best prime option, but how does it compare to the 20mm focal length on a wide-angle zoom? The Canon EF 11-24mm f/4L and the Sigma 12-24mm f/4.5-5.6 provide a more versatile wide-angle focal range, including an ultra-wide angle 11 or 12mm setting, but they don’t offer the Sigma prime’s “fast” maximum aperture. That aperture makes the Sigma A the preferable low-light option, with significantly better light transmission, as well as the better choice for creative shallow depth-of-field effects. At around 20mm, the Canon EF 11-24mm F/4L is marginally sharper than the Sigma 20mm f/1.4 A between f/4 and f/11, but to be fair, there’s not much in it, and with a hefty $2899 price tag, the Canon’s flagship wide-angle zoom costs three times as much. The $949 Sigma 12-24mm f/4.5-5.6 zoom isn’t as uniformly sharp as the Sigma prime or Canon zoom between f/5.6 and f/11, and at their respective minimum aperture settings — a crucial setting for long depth-of-field landscape or architectural shots — the Sigma prime just has the edge, although it stops down only to f/16. Sigma Art high-quality primes have all demonstrated their great pedigree, with first-class sharpness across all 20mm, 24mm, 35mm, 50mm, and 85mm models, and a fast f/1.4 maximum aperture for low-light photography and attractive background bokeh. They’re not the cheapest primes, and $899 for the Sigma 20mm f/1.4 A will be a significant investment in a wide-angle prime for many photographers. You get an awful lot of lens for your money, however, with the Sigma 20mm f/1.4 A boasting good build quality, a focus distance window, and crucially, great image quality. The Sigma 20mm f/1.4 A is one of the sharpest lenses we’ve tested, ranking in 21st place for sharpness out of all the lenses in our database, with a score of 33 P-Mpix tested on the EOS 5DS R. Sigma’s flagship 20mm prime actually realizes more of the resolution potential of the lower-resolution 22.3Mp EOS 5D Mark III, however, with a score of 18 P-Mpix (equating to 80% of the 5D Mark III’s resolution compared to 66% for the 5DS R). To summarize, this lens is very sharp, offering edge-to-edge resolution between f/4 and f/16, and very good results at the wider aperture settings, too. If your photography demands great image quality results at 20mm, and you can live without a f/22 minimum aperture, you won’t go wrong with the Sigma 20mm f/1.4 A.